Samantha Johnson has been practicing law for 10 years. Even before attending law school, Samantha Johnson began her work in the field of criminal law. While at the University of Central Florida, Samantha Johnson worked with victim advocates as an intern in the Victim Services Unit. 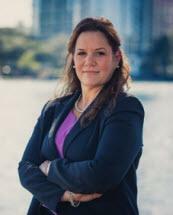 Following her graduation from the University of Central Florida, she began working with the Office of the Public Defender, Eleventh Circuit, in Miami Florida as a paralegal in the early representation. After attending and graduating from Barry University, School of Law, Samantha began working with the Office of the State Attorney as a Victim Advocate. To date, her unique experience has allowed her to work on both sides of the table and gain a more complete understanding of the practice of criminal law. It was shortly after that Attorney Johnson became an Assistant Public Defender at the Office of the Public Defender in Orlando. After some years with the Public Defender's Office, Samantha went out on her own in 2009 and has been working in the practice of criminal defense in many counties across Central and South Florida. Those counties included, Palm Beach, St. Lucie, Lee, Hendry, Lake, Polk, Volusia, Osceola, Seminole and Orange County. This experience has familiarized her with a number of different judges and prosecutors and has established a good working relationship with many. Samantha Johnson has now teamed up with attorney Corey Cohen. With both of their extensive knowledge and experience, together, they both look forward to working with you in helping you to fight your case.